The Broad-tailed hummingbird has many unique features. 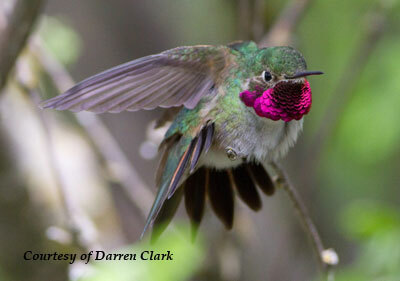 In our opinion, it is one of the easier tasks of hummingbird identification. 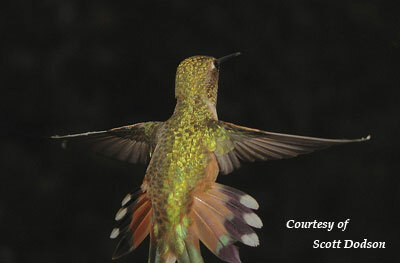 To begin with, this hummingbird was named for its long, broad tail that projects beyond its wings. With a length of 4inches (10cm) and a wingspan of 5.25 inches (13 cm), it is larger than other species sharing the same territory such as Allen’s and Rufous hummingbirds. If you visit the "Rockies" or the "Sierras" you will likely see the Broad-tailed hummingbird, anywhere from Arizona and New Mexico all the way up to Idaho and Montana. You may find them bathing or drinking in the shallow mountain streams. They will mate and nest at elevations from 4,000 to 12,000 feet. The Broad-tailed will establish and defend large territories which can be over an acre. These territories are defended against other hummingbirds along with other large birds such as Grosbeaks, Kingbirds and Hawks. When identifying this bird, you should first look for the unusual. Normally, the bill is long and straight or only slightly downcurved. That said, a Broad-tailed hummingbird has other distinct characteristics. I am going to mention the body position because this hummingbird holds itself a bit more horizontally. Most hummingbirds hold their body in a more upright position. Broad-tailed Hummingbird Traits To Look For! Adult Male: The throat (gorget) is a brilliant rose red or hot pink. The body is a brilliant grass green or emerald green above. The undersides are white with a grey-green vest and greenish sides (flanks). Juvenile Male: Until the molting (shedding of early feathers), the throat is a dull greenish color. After molting they start to develop the typical male gorget but it is not until the following Spring that the brilliant gorget is fully developed. 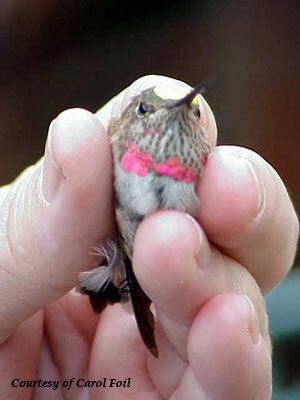 Female: The gorget is an evenly speckled greenish-bronze color. Body has a green back and white under parts. The sides are a pale rufous color but can have a few reddish feathers. The tail has a green center and is tipped with white. Some reside in Mexico and Guatemala where they remain year round. The migratory birds have been spotted in Arizona, California, Colorado, Idaho, Montana, Nevada, Utah, and Wyoming during the Spring, Summer, and Autumn. Weather patterns and food availability affect the timing of migration for these tiny birds. Generally speaking, males which are first to migrate, can be found in Arizona by the end of February. They might not reach the northern states such as Montana until May. See our interactive migration map on our Hummingbird Migration page where you can submit your sightings which helps others in the area follow the Spring migration. We would absolutely appreciate more sightings from the western states where these birds live. Our Hummingbird Migration page is very busy during the Spring migration and your submitted sightings alerts others to be prepared for the annual Spring arrivals. Migratory Broad-tailed hummingbirds live on the rugged mountain terrain, cliffs, woodlands, and suburban gardens of the western United States. Non-migratory birds exist in the subtropical climates of Mexico and Guatemala. They require a source of high quality nectar from flowers and hummingbird feeders, protein from insects, a water supply (natural or from special hummingbird birdbaths), and trees for shelter and perching. 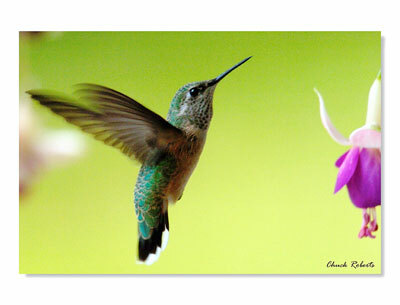 Overall, this hummingbird is easy to identify because of so many fascinating characteristics. They are placed in the "Least Threatened" Conservation Status.